1/1, July 1903-35/140 October 1938. 40 pp. 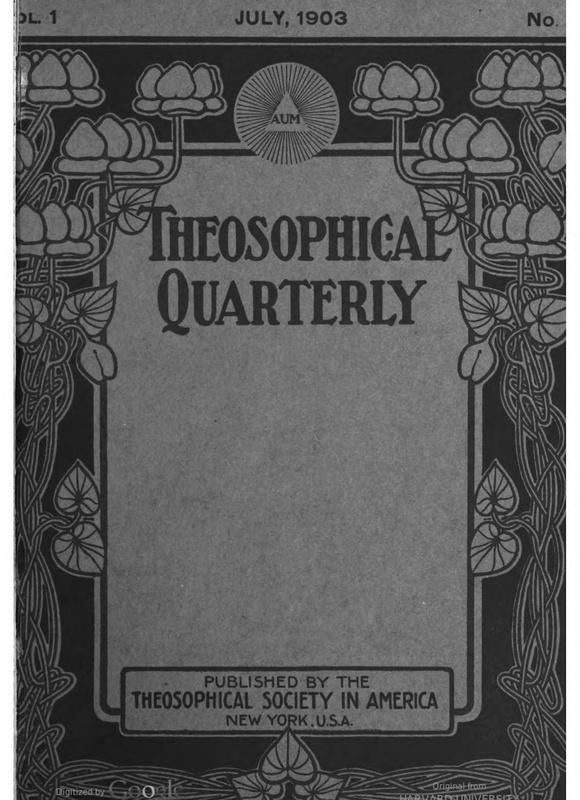 This was the journal of the Theosophical Society in America, which was created by A.H. Spencer and Ernest Temple Hargrove, quondam secretary of W.Q. Judge, after a dispute with Katherine Tingley. Its notable members included Charles and Vera Johnston (H.P. Blavatsky’s niece), Archibald Keightley and his wife, Julia van der Planck ("Jasper Niemand"). The journal was originally begun as the more thoughtful companion of Theosophical Forum, which expired in 1905, and featured republished articles, reports on the activities of the Theosophical Society in America, explanations and answers to beginners, and review of Theosophical literature. The society purported to follow Theosophy as originally laid down by H.P. Blavatsky but was generally more Christian and mystical than the orthodox Theosophical Society of Adyar. ZDB: Stuttgart WLB; Freiburg Inst Grenzgeb Psychol; Berlin SBB Haus Potsdamer Strasse; NYPL; LOC; Columbia University; Cornell University; SUNY at Buffalo; Yale University.